his species must be the largest of all the Aspera varieties we have at the nursery - it's grown over 10 feet tall and slightly less in width. The 8 inch flowers remind us of the Sargentiana blooms only larger. We've seen blooms that are 12 inches across! The ray flowers are white that age slightly pink and the fertile center flowers are purple. Leaves and stems stand out from other Asperas because they are so fuzzy. Big, bold leaves and large clusters of long-lasting flowers in white, pink, red, or blue. Summer and fall bloom. Flower clusters may contain sterile flowers (conspicuous, with large,petal-like sepals) or fertile flowers (small, starry petaled); or they may feature a cluster of small fertile flowers surrounded by ring of big sterile ones (these are called lacecap hydrangeas). Sterile flowers last for a long time (often holding up for months), gradually fading in color. Hydrangea aspera Click to Enlarge Hydrangea aspera From eastern Asia, this imposing shrub grows 10–12 ft. tall, spreading nearly as wide. Dark green, somewhat hairy leaves reach 10 in. long, 4 in.wide. Rather flat, 10-in. flower clusters contain purplish white to pink fertile flowers surrounded by 1-in. white, pink, or purple sterile blooms. Young plants have to be grown from seeds for propagation. You can also use 8-10 cm cuttings of the young tree or more mature tree by placing it in a frame in late summer. Once you help the cutting over-winter, you can plant it outside in late spring. You will have to wait a year before the plant starts flowering. Leaf bud cuttings of the current season can be put in a frame and used for immediate propagation also. Early frost, indiscriminate pruning and honey fungus are three of the things that can negatively impact the Hydrangea aspera. Light: sunny to semi-shady; soil type: sandy-loamy to loamy; nutrient concentration: normal; pH value of the soil: acid to neutral; soil: fresh to moist. 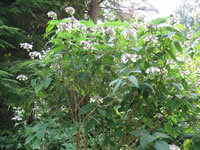 DemandsFrost-hardy but not fume-hardy shrub for gardens, containers and parks. Does not tolerate soil compaction. Light: sunny to semi-shady.Growth1.5 - 2m high, diameter 1.5 - 2m LeavesDeciduous lance-shaped leaves. Serrated edge. Leaves are grey-green above, light green below. Size: 10-30cm long, 4-6cm wide. The leaves are rugose and rough. Summer Flowering Plant type:	Shrub Deciduous/evergreen:	Deciduous Cold hardiness zones:	5 - 9 Light needs:	Partial sun Sunset climate zones:	3 - 9, 14 - 24, 28 - 34, 39 Water Needs:	Needs wet or constantly moist soil. Average landscape size:	Fast grower to 4 to 6 ft. tall and wide. 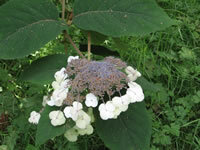 Growth rate:	Fast Hydrangea can grow in most soil types, but will be most successful if the soil retains moisture well. Even if you live in a drier climate, frequent watering, making sure to not let the soil completely dry out, will keep your lacecap hydrangea alive and flourishing. The majority of hydrangeas grow well in largely shaded areas because most of them are woodland plants. The flowers of lacecap hydrangeas are not tolerant of excessive sunlight and will burn if they are not protected from harsh mid-day sun. Your lacecap hydrangea will not require much pruning, but when you do prune timing is crucial. Lacecap hydrangeas bloom on old wood, which are stems that have been on the plant since the previous season. Seed - surface sow in a greenhouse in spring. Cover the pot with paper until the seed germinates. When they are large enough to handle, prick the seedlings out into individual pots and grow them on in the greenhouse for at least their first winter. Plant them out into their permanent positions in late spring or early summer, after the last expected frosts. Cuttings of half-ripe wood, 8cm long, July/August in a frame. Overwinter in a greenhouse and plant out in late spring. Cuttings of mature wood in late autumn in a frame. Mound layering in spring. Takes 12 months. Leaf-bud cuttings of the current seasons growth in a frame.Note that pruning is not the same thing as removing the dead blooms. (See below "Removing Old Blooms.") There exists a small group of mophead hydrangea that will bloom no matter when they are pruned. ('Endless Summer' is this type of hydrangea). Your garden center can tell you when you purchase a hydrangea if it is in this special category called "everbloomers." But for the vast majority of hydrangeas, pruning after July will likely result in fewer blooms the next summer. THERE ARE CERTAIN INSTANCES WHEN PRUNING CAN BE HELPFUL: (1) All dead stems should be removed from hydrangeas every year. (2) After the plants are at least 5 years old, about 1/3 of the older (living) stems can be removed down to the ground each summer. This will revitalize the plant. (3) In addition, if it becomes necessary to prune a plant to reduce its size, it may be cut back in June or July without harming the next year's bloom. But it will return almost immediately to it's former size. This is one reason why it's best to plant a hydrangea where it does not have to be pruned.